"Please," Eric Carmen begs, "Don't ask me why Dirty Dancing became what it is." It's midday in midsummer in the lounge of a Worcester, MA, hotel, and Carmen is explaining how every question he gets these days goes like this: "Why is Dirty Dancing such a phenomenon?" I pretend to scratch out my next question with a pen. Carmen laughs. His girlfriend laughs. As I'm sitting there talking with Eric, he looks younger than his 38 years. Recent photos in Rolling Stone and Billboard had him appearing old, so I expected this aging rock star. Instead, he looks good—fresh, happy, and relaxed. The night before, he had played in front of a loud and frenzied Worcester Centrum crowd as part of the Dirty Dancing concert tour. While normally analytical, Carmen prefers not to guess why this whole Dirty Dancing craze is happening. But it seems pretty simple: All you need is a box-office smash movie that can spark a fad (the hip-grinding, provocative style of dirty dancing); a Top 10 soundtrack album; several hit singles (one of which is Carmen's performance of "Hungry Eyes"); another Top 10 soundtrack (More Dirty Dancing); and a barnstorming tour that features dancers from the movie and half-hour sets by a handful of the soundtrack's stars. While Carmen is but a small part of the Dirty Dancing picture, he's watched it thrust him back into pop stardom. "Hungry Eyes" even led to a request by Arista Records for Carmen to record a new single for his first-ever greatest hits compilation in the United States, The Best of Eric Carmen. When that song, "Make Me Lose Control," followed "Hungry Eyes" into the Top 5, it was clear that Carmen's "retirement" from recording was over. At least for now. The wild enthusiasm of the audiences during his five-song set on the Dirty Dancing Tour didn't hurt, either. Carmen's return comes three years after his self-titled album for Geffen Records had bombed. That the recording flopped commercially is curious, because it served as a testimony to Carmen's songwriting skills, his distinctive vocal talents, and his versatility as a musician. But when Geffen didn't renew his contract, he decided to retire. "In all honesty, I did reach a point where my motivations for doing what I do had changed," he says. "When I was 22, I needed the girls screaming at me. At 38, my goals are different. It was fun last night to be screamed at, but that's not why I was there. It's more a matter of…" Carmen pauses, suddenly smiling, then finishes his sentence: "…making a living." Actually, Carmen could have lived a perfectly comfortable life on royalty checks. As leader of the Raspberries, he scored with power-pop hits such as "Go All the Way," "I Wanna Be With You," "Let's Pretend," and "Overnight Sensation." As a solo artist, he's enjoyed several more hits, including "All By Myself," "Never Gonna Fall in Love Again," "Sunrise," and "Change of Heart." I realized that what I'd always liked doing more than anything else was songwriting. His songs have been covered by everyone from Mike Reno & Ann Wilson (who recorded "Almost Paradise" for the Footloose soundtrack), the Dead Boys, Patti LaBelle, Frank Sinatra, and Met Torme to Shaun Cassidy, the Bay City Rollers, Cher, Olivia Newton-John, Franki Valli, and Paul Anka. Even country singers—Hank Williams Jr., Donna Fargo, and Louise Mandrell—have recorded some of Carmen's songs. And for a real "riot," Carmen says, check out the King's Singers' version of "All By Myself." "You picture 75 guys on a riser singing 'All by myself…' 'All by ourselves' would make more sense. But it would have been a funny video. It sounds like something Harry Nilsson would get involved in." So Carmen's withdrawal from recording wasn't a matter of giving up. "I realized that what I'd always liked doing more than anything else was songwriting," he says. "There came a point, around 1978, when I quit touring. I said, 'I don't need to ever do this again,' Billy Joel loves to perform; he thinks I'm crazy because I don't live to get up on stage. But I always thought he was crazy because he wants to be out there beating himself to a pulp every day." It's not the performing part of touring that bothers Carmen: "The stage is the highlight of my day, " he says. "It's the traveling and the hotels and the packing and unpacking—just the logistics of getting to and from every place—that knocks the heck out of you. It's a grueling kind of existence. But it's a grind he's willingly taken on again. The only hint of the wear and tear this early in the tour is his voice: It sounds scratchy and irritated. But Carmen is as talkative as ever as he expresses surprise at the events of the past few months. How could the best song he ever wrote, "Boats Against the Current" have done so poorly on singles charts in 1977 when "Hungry Eyes"—an average pop song that be didn't even write—capture the ear of so many people? "'Boats Against the Current' may have been too intelligent of a record," Carmen says. "If you see 'All By Myself' sitting label-side up on a table, you know immediately what it's about. But 'Boats Against the Current' isn't so obvious. 'All by Myself' was a heart song; 'Boats' is a brain song. It may not be a mass audience record." "Boats" is a brilliant piece of rock balladry. (Carmen plans on re-recording the song someday, although he says he'd change it very little.) The fact that it didn't make a dent on singles charts 11 years ago is one of many ironies in Carmen's career. In analyzing Carmen's career as a musician, that word—irony—keeps cropping up, even if you so all the way back to his preschool years. He started playing piano at the age of 2, took violin lessons from an aunt who played in the Cleveland Symphony Orchestra, and later studied classical piano, music theory, harmony, and viola at the Cleveland Institute of Music. So it was ironic that when the Beatles and the Beach Boys burst onto the popular music scene, Carmen got the fever. He took up guitar and began playing in Cleveland area rock bands. The idea was to have swarms of panting teenage girls swooning over his Mick Jagger swaggers and struts. In between stints with the Choir, Cyrus Erie, and the Quick, Carmen released a solo single, "Light the Way," for Epic Records. Cyrus Eric also recorded a couple of singles, but they're nearly impossible to find today. "Thank God! I hope they've lost the tapes," Carmen says. "They were terrible. The solo record was even worse. Those were my first couple of years of having any idea—actually, I had no idea—of what went on in the recording studio. I sat down with somebody who I thought was 'the producer' and I thought, 'Wow! The producer!' Little did I realize that 90 percent of the guys who were out there putting their names on records as 'producer' hadn't the foggiest notion of what was going on in the studio. In fact, a lot of the engineers in those days hated rock music. One guy who worked on my sessions at CBS In New York usually did classical sessions, arid he dreaded the thought of going in to engineer for a rock band." One of Carmen's "idols" in his early days was a Cleveland band called the Mods. The group included guitarist Wally Bryson, bassist David Smalley, and drummer Jim Bonfanti—who joined forces with Carmen around 1970 and started the Raspberries. Signed to Capitol Records—the same label for which the Beatles and Beach Boys recorded—the Raspberries began working on their first albumin 1971. The Raspberries were an irony in themselves. With a name so sweet and innocent, You'd expect their music to be about as beefy as a 1910 Fruitgum Co. song. But the band had a sharp edge and a keen ear for rock'n'roll. Between the teen scene and the expectations to fill the Beatles' big shoes, the Raspberries were being yanked in different directions. All the while, though, their plan was to make spirited pop/rock music that bridged the early-'70s gap between AM and FM radio. They accomplished that with "Go All the Way" and their first album, then came up with an even better second album, Fresh. When the Raspberries released their third album, Side 3, the ironies proved too much for half the group. A critics' favorite, Side 3 contained high-energy guitar slashing that was more evocative of the Who than the Beach Boys. But the album stalled on the charts, and the Raspberries split in half. The defectors were Smalley and Bonfanti, who had lost patience with Capitol Records' meddling (the label still had the group in matching outfits on stage) or with Carmen's ideas for the band. "Smalley wanted to go on stage in jeans or his regular street clothes," Carmen told critic Randall S. Davis In the mid-'70s. "He thought I was writing songs for teenyboppers and that Wally and I were dressing like gays because we were wearing shoes with heels. He called me the 'King of the teenyboppers' one day so I told him that I would rather dress like a gay than an itinerant farm worker, and that was it." Carmen and Bryson carried on with two new members, drummer Mike McBride and guitarist Scott McCarl. The Raspberries then released their best album, appropriately titled Starting Over. Along with the title track—a familiar Carmen ballad—the album included the most raucous rock the Raspberries had recorded. It also featured Eric's finest production number: "Overnight Sensation (Hit Record)." Critics again lauded the Raspberries, but the album failed to fire up the charts. In the final analysis, you want to make a record that lots of people hear. A discouraged Carmen called it quits in 1974. The Raspberries, sadly, had been unable to shake the many labels pinned to their chests. But in the space of three years and four albums, they made some of the brightest, most melodic, liveliest pop/rock of the '70s. Caught in a rock'n'roll time warp and trying to find a way to get out." Ironically, the Raspberries are suddenly vogue—14 years after they broke up. Compact discs have helped, as reissues of '60s and '70s music sparked nostalgia kicks. Those who grew up in the '70s were anticipating the digital release of their favorite music from that era. So far, Raspberries fans have seen a 16-track import from ZAP! Records and a four-track CD-3 from Rhino Records. But don't be surprised if either Rhino Or Capitol packages a compilation within the next year. Eric Carmen's solo career has produced more ironies, starting with his first post-Berries hit, "All By Myself," from 1976, was the unlikeliest of Top 10 singles, with its slow tempo, depressing lyrics, suicidal vocal, sobbing strings, and boomy bass drum. Equally curious as a Top 10 hit was the follow-up single, "Never Gonna Fall in Love Again," which was based not-so-loosely on a Rachmaninoff symphony. The third—the bouncy rocker "Sunrise" made more sense. With the success of his first solo album, recorded for Arista, Carmen won the artistic freedom that every musician desires. Instead of compromising on his second album, he took on the production and arranging duties himself. What he came up with was Boats Against The Current, his most intelligent, powerful recording. Today, Boats stands as a simply masterful album—brainy but romantic, intellectual but emotional. It boasts the brilliantly moving title track (which alludes to F. Scott Fitzgerald's The Great Gatsby), a Top 40, boppy pop number in "She Did It", two heartbreaking, gut-wrenching ballads, in 'Nowhere to Hide" and "Run Away," and the classical-sounding "Love Is All That Matters." Boats should have been sailing in green. But it sank, having made little impact on the charts. Within a couple of years, it was already banished to cutout record bins for as little as 25 cents. Another irony. "Boats was a very successful record for me on an artistic level," Carmen says now. "I really did not compromise at all in making that record. But there might be a total of only half-a-million people all over the world—maybe it's more than that—who have heard it. "In the final analysis, you want to make a record that lots of people hear. I can sit and say, 'Gee, I'm going to make a no-compromise album but if in doing that I estrange the record company and make them so unhappy with the product—or even less than thrilled—then they won't promote it property. Then I run the risk of having no one hear the record, when indeed if I'd made a small compromise here or a small one there, I eventually get the backing of the company. "If I totally forgot about the situation of making a hit record, if I had total artistic freedom, I suppose I could do something like a voice/piano album. But that would bore a lot of people, so what I do is simply make the best album I can under the circumstances at that moment, and hope that each given record forwards my progress to a point where next time I have a little more freedom, and where a few more people will like what you do sight unseen. "I guess the perfect example of somebody like that is a Bruce Springsteen, or a Jackson Browne. But even with Bruce, who has as little to do with compromise as one could possibly have, I'm not so sure. In his wildest dreams of 10 years ago, he probably never thought he'd be doing a dance mix of any Bruce Springsteen record, like he did with 'Dancing in the Dark.' These things are all part of the politics of making a record, I'm afraid." I suppose "Boats Against The Current" isn't a very good record to listen to if you're suicidal. With Boats, Carmen won most of his battles. It took the commercial success and revenues of his first album to enable the chance to make a record that was such a risk. "A lot of people I've talked to who didn't like that album felt that way primarily because it was such a downer. I didn't really think of it that way when I was making the record, but I guess it was. There was very little relief from that pervading pessimism. Between 'Runaway' and 'Nowhere to Hide,' I suppose Boats isn't a very good record to listen to if you're suicidal. In 1979, Carmen came back with an album more compromising, much happier, and less substantive. Change of Heart charted a Top 20 hit (the title track) and a minor hit ("Baby I Need Your Lovin'"), but the album's sugary aura didn't help Eric's image. Two years later, though, he released the fiery Tonight You're Mine. This sharp-edged album was Carmen's hardest sounding rock since his Raspberries days, and critics were mostly impressed. But the public didn't listen, and the album quickly slid off charts, despite the excellent single "It Hurts Too Much." It was 1984 before Carmen reappeared, and this time it was with a new label, Geffen. Although he had been spending most of his time in Cleveland, he moved to Los Angeles to work on the simply titled Eric Carmen. He come up with an adventurous mix of pop balladry and bouncy rockers, including the single "I Wanna Hear It from Your Lips." "What happened with Geffen was that I was signed to the label by John David Kalodner, who's still one of my favorite people in the music business. It had taken him about two years to get up the guts to sign me, because every artist he had ever signed to the label prior to me sounded, in his own words, like Sammy Hagar—power rock kinds of acts, a little harder than what I normally am, or at least what he perceived me to be." But what attracted Kalodner to Carmen's music were two ballads, "She Remembered" and "I'm Through with Love." "I remember sitting in his office one day listening to a Sammy Hagar track, and it was the filthiest record I'd ever heard in my life. It was absolutely obscene—I liked it," Carmen laughs. "John looked over casually and said, 'It's amazing. Everyone I ever signed to the label sounds like this. And then, there's you.' He meant it as a great compliment. He had originally signed Journey and Hagar and Whitesnake and groups like that, so he couldn't quite figure out how I fit in. "We spent $100,000 doing a video for 'I Wanna Hear It From Your Lips,' and it was disastrous and fortunately never saw the light of day. We also had shot a video for the second single, plus we'd spent a quarter of a million dollars just making the album. So before the record ever hit music stores, Geffen was already in for a half-million dollars. "The first single shot up the charts—just shy of the Top 40—but Geffen suddenly stopped promoting the record. That was it—they weren't going to spend any more money on it." It wasn't long before the album dropped out of sight, Geffen dropped Carmen, and Carmen dropped out of music, retiring back to Cleveland. Ironically, Carmen was nominated for a Grammy Award a year later. "Almost Paradise," a song he wrote with lyricist Dean Pitchford for the movie Footloose, cracked the Top 10, and was one of four singles up for Best Song of the Year in 1985. The success of Almost Paradise" encouraged Carmen to continue writing while avoiding the rock scene. (One exception: a song he wrote and recorded, "The Rock Stops Here," to promote his native Cleveland as the home of the Rock'n'Roll Hall of Fame). But sometime in 1987, Carmen's former producer, Jimmy lenner, called and asked whether Eric would be interested in recording a song for a new movie. Carmen took him up on it, and smack in the middle of this year's biggest box office hit was "Hungry Eyes," as performed by a familiar old voice. Dirty Dancing evolved into the summer tour, featuring Carmen along with Bill Medley, Merry Clayton, and the Contours and attracting an audience that ranged from pre-teenyboppers to middle-aged fans of '50s pop. It seemed a strange career move for Carmen, whose Raspberries had discovered that a teenybop label was a kiss of death. But there was Eric playing once again in front of screaming, swooning teenagers. Ironically, it was his original motive for becoming a performer, but that was 20 long years before. On the other hand, the tour gave Carmen more exposure than he'd ever had. So he wisely took the opportunity to expose the audience—in about a half-hour—to all the phases of his career. He played a familiar Raspberries classic, "Go All the Way." He performed a raucous, upbeat rendition of his newest hit, "Make Me Lose Control." He played the long version (at most of the concert dates) of "All By Myself," complete with its extended classical piano middle. He turned in a sultry reading, with Clayton, of "Almost Paradise." And he closed with "Hungry Eyes." That brings up yet another irony. Here was Eric Carmen on a major tour, with his first-ever greatest hits collection freshly released in the United States—and he didn't even have a record contract. Arista had rushed The Best of Eric Carmen into stores so quickly that the first pressing didn't even include "Make Me Lose Control." But the label was taking its time in signing Carmen to a new deal. I don't have to be 'Joe Rock Star' 24-hours a day. When I walk into my favorite restaurant there every week, it doesn't matter if I'm No. 10 on the charts or not on the charts at all. At this writing, he's negotiating with other labels, but he'll most likely end up with Arista again. And this is the part of music he'd rather avoid. Carmen enjoys being recognized in public, but can live without the business end of it (his younger brother Fred now handles that part of his career). He loves the idea of an "Overnight Sensation" playing on the radio, but not at the expense of selling his soul. "I got to a point after the Geffen album where I just didn't enjoy being in L.A.," he says. "I'm a little bit older, the stage doesn't hold the same magic for me that it once did, and my goals were different. Since I went back to Ohio (in 1985) to write and produce, I can honestly tell you that the last couple of years have been the happiest of my life, because of Suzie here (Carmen's 27-year-old, attractive girlfriend, Susan Brown), and partly because I've been in my home town, Beachwood, where I like to be. It's just a great place—fresh air, trees, family nearby, friends. And I don't have to be 'Joe Rock Star' 24-hours a day. When I walk into my favorite restaurant there every week, it doesn't matter if I'm No. 10 on the charts or not on the charts at all. They're waiting for Eric Carmen, 'nice guy,' not Eric Carmen, 'rock star.' And it makes reality a lot easier when everyone you meet is not concerned with your chart position." Still, don't rule out a new album and a solo tour. "It's not so much that I want to or I don't want to," he explains. "Now I have to. Recording is something I always enjoyed. If there's a reason to perform, then I'll do it. The fact that I'm up on stage and there are people screaming at me is an amazing thing. But it's the reason I'm there, because there's a whole new group of people listening to my music." One last irony: Carmen's best albums have been the least promoted by record labels. So it's odd that his return has happened without a PR firm. Past publicists have proven to be ineffective, so Carmen is relying on Arista Records and on a friend with influence, Tricia Daniels. An associate producer at Good Morning America, Daniels is perhaps the most obsessed Carmen fan this side of Eric's mother. She's helped attract some valuable coverage—a piece in Rolling Stone (although the fact the music editor David Wild is also a longtime Carmen fan didn't hurt), one in the USA Today, and a spot (naturally) on Good Morning America. But she's also very "possessive" of Carmen, as one magazine writer told me. She tends to shield him at times, so various press opportunities have fallen through the cracks. But what's one more irony in a career of ironies? Back in 1974, during the rocky final days of his under appreciated band the Raspberries, Eric Carmen wrote a song called "Overnight Sensation (Hit Record)," which was not only a typically inspired piece of pure pop but also a compelling statement of purpose: "Well, I know it sounds funny," he sang, "but I'm not in it for the money, no / I don't need no reputation / And I'm not in it for the show / I just want a hit record / Want to hear it on the radio / Want a big hit record / One that everybody's got to know." Fifteen years later, as he sits in Beachwood Studios, in his home town of Cleveland, Ohio, and considers the surprise success of "Hungry Eyes"—his first "big bit record" of the decade, off the Dirty Dancing soundtrack—Carmen, 38, can hardly stop grinning. "I feel vindicated," he says, as he leans back toward the mixing board. "I feel…good." As well he should. After all, for a musician with a devout pop sensibility, Eric Carmen had a surprising amount of difficulty connecting with a mass audience. Part of the problem has been bad timing. The Raspberries—now best remembered for classic singles, like "Go All the Way," "Let's Pretend" and "I Wanna Be with You"—hit the scene with their clean-cut sound and image, inspired by the Beatles and the Beach Boys, in an era ruled by long hair, long jeans and long blues jams. "Our audiences were always the most bizarre mix," Carmen says. "You'd have a thousand screaming girls in the front of the stage and then ten very serious rock critics in the back of the room going, 'Uh-huh, I think we understand this.' And unfortunately the great mass of pot-smoking eighteen year-olds that bought albums and made you a substantial commodity in the great marketing world of records never took to us. It was not hip for people to like us, because their little sister liked us." By 1974, when the Raspberries hit it big with their critically acclaimed album Starting Over, things were getting ugly within the band. "We attempted democracy, as it was the thing to do at the time," says Carmen. "But unfortunately there's usually not an equal distribution of talent, brains or whatever. If something went wrong, I got blamed. If something went right, the band did it." Unsurprisingly, Carmen, decided to go his own way: "I suppose I just got tired of being told that my songs sucked." Time has been kind to the Raspberries, who are now viewed as a precursor to the back-to-basics pop sound that would become an integral part of the New Wave movement. "We're now the legendary Raspberries as opposed to the 'ha-ha' Raspberries of yesteryear," says Carmen, with only the slightest trace of bitterness in his voice. "People who were the right age to like the Raspberries then are now coming into positions of power, so now, when I talk to program directors and music directors and rock writers, instead of laughing at the Raspberries, they're admitted fans." "I always wrote ballads, and I always wrote rockers," Carmen says in his own defense. "But the record company saw what hit first, and naturally they wanted more of the same. But it's been difficult. Half the people tell me, 'I love "Go All the Way," but why do you have to write all those schlocky ballads?' And half say, 'I love "All By Myself," but why do you waste your time with this rock & roll stuff?' I'd like to think that I could do both." After three more albums for Arista and one in 1985 for Geffen, Carmen found himself labelless. Last year, though, opportunity—in the form of Jimmy Ienner—knocked. Ienner called to say he was working on a soundtrack for a movie called Dirty Dancing and had a song that he thought would be perfect for Carmen. "It was a really bizarre-sounding demo," says Carmen, "obviously done in somebody's basement But the song seemed to be there, so I said I'd do it. Who knew?" Carmen says he was pleased by the prominent placement "Hungry Eyes" got in the final film. (He'd been less pleased with the placement of "Almost Paradise," the smash he'd co-written for Ann Wilson and Mike Reno, in Footloose.) But Carmen, like so many others, is at a loss to explain the phenomenal popularity of the soundtrack album: "If I knew that, I would be making the next Dirty Dancing right now," he says. In order to capitalize on the success of "Hungry Eyes," Arista has rushed to release a Best of Eric Carmen package, and Carmen and Ienner recently re-teamed to record "Make Me Lose Control," a single that may eventually be added to the greatest hits collection. At press time, Carmen was close to re-signing to Arista, and he and lenner were considering working together on Carmen's next album. "Let's face it," Carmen says, "there's a real world out here. When you have a Top 5 record, people suddenly perceive you differently. So whether or not I'm any different than I was six months ago, I'm currently perceived as hot. And frankly, that's fine with me." Eric Carmen admits, "The last 13 years years has been a long painful period with much frustration." He has reason to say this. 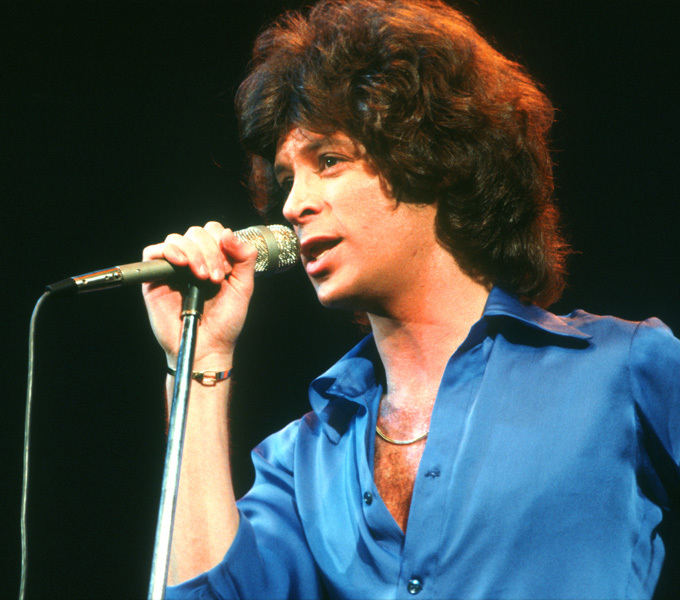 After releasing his last album Eric Carmen, he released two singles which quickly rose to the top of the hit charts: "Hungry Eyes," and "Make Me Lose Control." Soon after, he began working on his new album. However, because of conþicts with the record label and the producer assigned by the record label, his partly recorded album, which he spent 5 years making, was never released. He said he was so shocked that he was not able to set his hand to any work for the following two years. After he got over it, he changed to a new record label and started recording again. He spent two years bringing his new album to completion. Among the sweet love ballads like "I Was Born To Love You," which are what Eric Carmen is best known for, are songs with a taste of 60s pop scattered throughout the album. He said, "For this album, I wrote beautiful songs and piled them up just like building blocks which in turn gives the album one color. As all the responsibilities in making the album including producing the songs were left to me, I think I was able to express my sensitivity and style to the maximum extent. After playing with many bands in the 60s, his name became well known as a member of the Raspberries, a popular band which debuted in 1972. As a leader of the band, he played with them for 3 years. He asked Wally Bryson, former member and guitarist for the Raspberries, to join him on his new album. "When the band broke up, we had a bad relationship. We were on the worst terms, and I had not had any contact with Wally since. But, bad memories fade away as time goes by. So I called him up to ask if he would join me and he willingly responded, 'OK.' When we first met again after so many long years apart, we greeted each other and shook hands. After that, all those bad feelings in the past disappeared and I felt something very warm inside," he said. He started his solo career in 1975, and has also become active in providing songs to other musicians. In 1984, "Almost Paradise" written for a duet by Ann Wilson and Mike Reno hit #7 on the charts. Also, many of his songs including "All By Myself" have been covered by a number of musicians, and he is highly valued as a songwriter. "It is a honor for me to see my songs sung by other musicians and hit the charts again because it proves that my songs are accepted by people over the decades. But, I wish more attention would be paid to a writer of the song at the same time," he laughed. He is now planning a tour for the first time in 10 years. He's hoping to showcase everything from his major hit songs in the past to his new songs from Winter Dreams.